Today the School for Social Entrepreneurs (SSE), in partnership with Power to Change, have released positive new data from the first cohort of community businesses in England to be supported by Match Trading™ grants, a new type of grant funding. Match Trading is a new type of grant funding that pound-for-pound matches an increase in income from trading, created by SSE. By rewarding sales growth, Match Trading incentivises social organisations to develop their trading base, so they can build stronger futures. The community businesses that received the Match Trading grants generated £1.7m from trading over the course of the year, £591,000 higher than their trading income from the previous 12 months. What’s more, they achieved a typical 92% increase in income from trading. This compares with a typical increase of 19% amongst the control group, who did not receive Match Trading grant. Nineteen community businesses taking part in the Community Business Trade Up programme, run by SSE in partnership with Power to Change, were offered Match Trading grants of up to £10,000, effectively allowing them to double their grant funding allocation if they increased income from trading over and above their previous year’s income. They also received 12 days of learning over six months, to help them grow their organisations through trading. The control group received a £10,000 grant and the same learning sessions. For the businesses receiving the Match Trading grants, their income from trading as a proportion of total income increased by 14 percentage points, from 73% to 87%, between the baseline and the programme year, whilst for the control group there was no change. Roisin Tobin, Business Development Manager, Buzz Lockleaze, a community shop, café and garden that grows, produces and sells fresh and affordable food, offering volunteering and training opportunities, in Lockleaze, Bristol, was one of the participants in the Community Business Trade Up programme and received a Match Trading grant. The development of the Match Trading grant model is being supported by the Match Trading Task Force, comprising leading individuals from across the sector including funders and grant-giving foundations, the Office for Civil Society, local authorities and academics, who together are helping to shape the on-going development of Match Trading, sharing learning, data and expertise. The positive results announced today echo those of the first pilot project to use the Match Trading grants in 2015-16, which also saw 19 social entrepreneurs increase their income from trading. They were supported by Match Trading grants of up to £7,000 and a learning programme, as part of the Lloyds Bank Social Entrepreneurs Trade Up Programme, in partnership with SSE and jointly funded by Big Lottery Fund. Match Trading grants were launched in September 2017 by SSE. The School for Social Entrepreneurs (SSE) empowers people to create change in their communities and improve the lives of others. It supports social entrepreneurs, charity leaders and intrapreneurs: people who tackle social problems by starting, scaling and sustaining organisations. SSE helps more than 1,000 leaders of social change every year through courses, connections and support. Michael Young founded SSE in 1997 in London. Today, SSE’s network of schools impacts communities across the UK, Canada and India. www.the-sse.org. Match Trading™ is grant-funding that pound-for-pound matches an increase in income from trading. By rewarding sales growth, Match Trading™ incentivises social organisations to develop their trading base, so they can build stronger futures. Match Trading™ was created by the School for Social Entrepreneurs (SSE) from 20 years of experience of helping people to create sustainable change in their communities. Match Trading™ is made possible with the support of pioneer partners, Lloyds Banking Group and Big Lottery Fund, and programme partner Power to Change, and its development is overseen by a Task Force of 20 leading social-sector organisations. It will be used by at least 500 social enterprises and community businesses over five years. A Match Trading™ pilot saw 19 social enterprises increase their income from trading by around 90% in one year, with the additional support of an SSE learning programme. 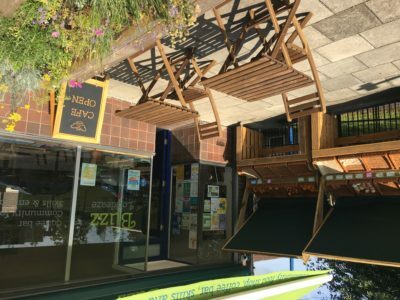 A second programme of 20 community businesses saw them increase their income from trading typically by 92% in one year (calculated by median), with the additional support of an SSE learning programme. Power to Change is the independent trust that supports community businesses in England. Community businesses are locally rooted, community-led, trading for community benefit and making life better for local people. There are nearly 7,000 community businesses across England employing 35,500 people, with a combined income of £1.2bn. From pubs to libraries; shops to bakeries; swimming pools to solar farms; community businesses are creating great products and services, providing employment and training and transforming lives. Follow this link to read some of our Community Business case studies. The Community Business Trade Up Programme is a learning programme accompanied by a grant or Match Trading™ grant of up to £10,000 for early-stage community businesses that are planning to grow. The programme is run by School for Social Entrepreneurs (SSE), in partnership with Power to Change. The programme includes 12 learning days, spread over six months. A community business is run by and for a local community. Its profits are reinvested for the benefit of that community. In the Match Trading group, there was a typical increase of 92% in income from trading, from £42,000 to £81,000 (comparing median income from trading by year).